In 8-inch skillet, melt butter over medium heat. Add 1/4 cup walnuts and the brown sugar; stir until sugar is melted. Add bananas; cook 1 to 2 minutes, stirring gently, until bananas are coated. Stir in orange juice and rum extract. Cook an additional minute or until liquid is thick and syrupy. Remove from heat. Reserve 4 banana slices for garnish. For each serving, spoon about 1/3 cup remaining banana mixture into each 10-oz. dessert bowl. Chop 1 granola bar; reserve 2 teaspoons for garnish. Sprinkle remaining chopped granola over banana mixture. Spoon 1 container yogurt over granola. 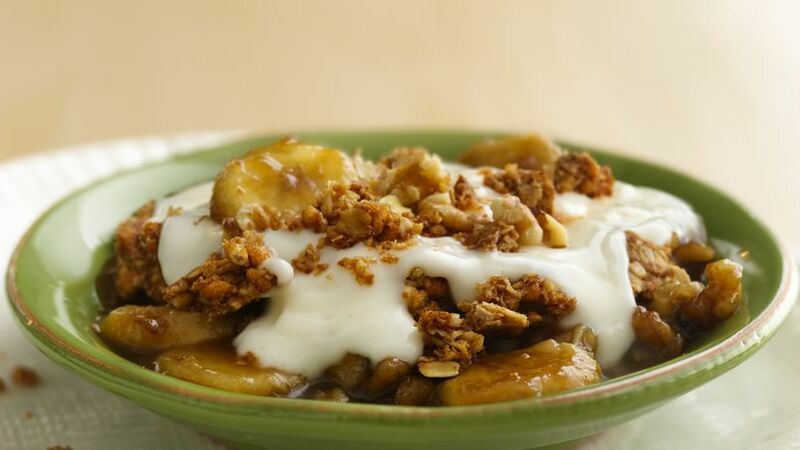 Garnish each serving with 1 teaspoon walnuts, reserved 2 teaspoons chopped granola and 1 reserved banana slice. Serve immediately.